Editor’s Note: This writeup was originally posted to LiveJournal in 2014, and then migrated here when I set up this site. I’ve since added a few more notes and pictures. 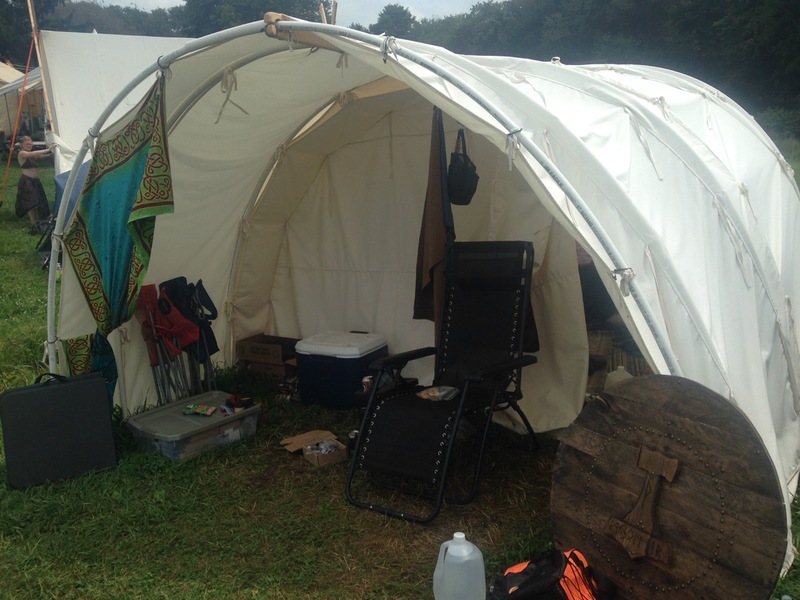 This summer we built a simple but spacious tent for use at Pennsic, an SCA medieval camping event held annually in late July near Pittsburgh. 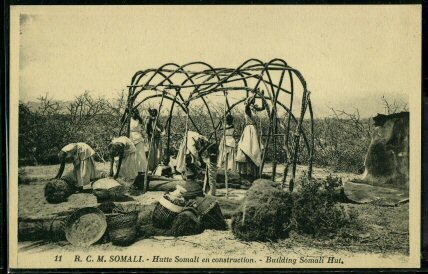 Below I outline the historical and contemporary sources we used for the tent design, detail the materials we used, and describe the construction process we followed, with photographs of the finished result. We wanted something we could build ourselves with only a few days of preparation, put up for two weeks at Pennsic, then store for 50 weeks of each year before being set up again. 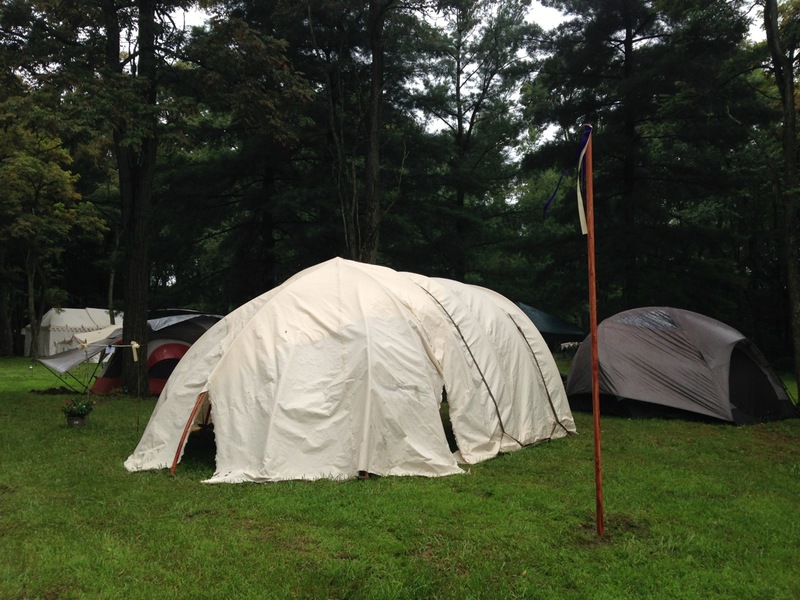 We wanted something distinctive, not one of the pavilions and wall tents that are pervasive at Pennsic. 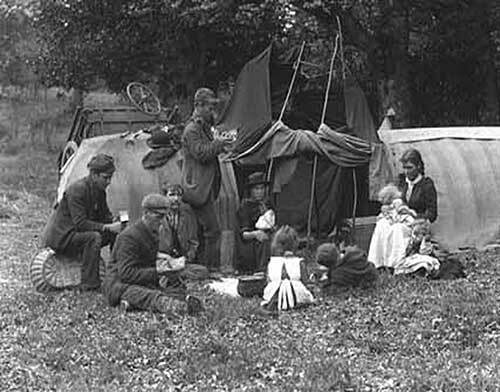 We wanted it to suggest a family of villagers camping at the annual fair, not a noble household or a military encampment. It should be reasonably period in appearance, meaning that we would use modern tools and materials, but hoped to not stray too far from the forms that might plausibly have been found in a Welsh village a thousand years ago. We needed a large space for use by two people for two weeks, to serve both as our bedroom/dressing room and also as a sitting room on rainy days, with lots of headroom so that we could both walk around inside comfortably without ducking down. We settled on a “bender” design, using poles bent into an arch and half-dome, with canvas draped over them. 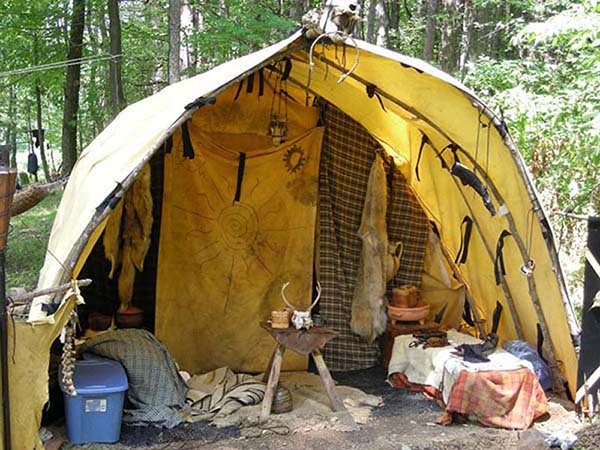 Although not common at SCA events, this type of tent has both an ancient history and a modern DIY tradition, outlined below. I looked at hundreds of different tent designs in the course of coming up with this plan. 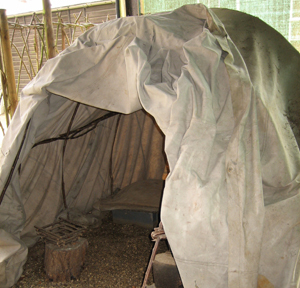 Arched and domed tents were used by the early Celts of the British Isles and by medieval Europeans. 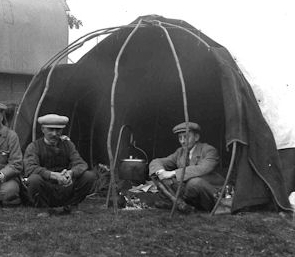 Bender tents are part of traditional Celtic culture. Keep adding poles wherever looks necessary until happy that it’s plenty sturdy enough and is a good dome shape with no gaps big enough that water will collect in the canvas. You should be able to hold on and hang your full weight from the center of a good bender frame. Here are a few benders built using these techniques. However, it is seemingly impossible to find these types of shelters displayed in period illustrations, both because they were unexceptional and because they were not used by the elite members of society. Early Welsh literature is silent on the typical styles of tents used in Wales during the medieval period. A description of a Scottish military camp does survive from the 1500s, in which most tents are small one-person benders of canvas draped over two arches made of joined poles. “I do not exactly know the Scottish mode of encampment in 1513, but Patten gives a curious description of that which he saw after the battle of Pinkey, in 1547: — ‘Here now, to say somewhat of the manner of their camp. As they had no pavilions, or round houses, of any commendable compass, so wear there few other tentes with posts, as the used manner of making is; and of these few also, none of above twenty foot length, but most far under… These white ridges … we found it a linen drapery, of the coarser cambryk in dede, for it was all of canvas sheets, and wear the tenticles, or rather cabyns and couches of their soldiers; the which (much after the common building of their country beside) had they framed of four sticks, about an ell long a piece, whereof two fastened together at one end aloft, and the other two ends beneath stuck in the ground, an ell asunder, standing in fashion like the bowes of a sowes yoke; over two such bowes (one, as it were, at their head, the other at their feet) they stretched a sheet down on both sides, whereby their cabin became roofed like a ridge, but skant shut at both ends, and not very close beneath on the sides, unless their sticks were the shorter, or their wives the more liberal to lend them larger napery; howbeit, when they had lined the, and stuff’d them so thick with straw, with the weather as it was not very cold, when they wear ones couched, they were as warm as they had been wrapt in horses dung.” — Patten’s Account of Somerset’s Expedition, 1547; quoted in the Appendix to Marmion, 1855, Page 169, Note 3F, by J. W. Lake; in turn quoted in Ancient and Modern Britons: A Retrospect, Volume 1, 1884, page 169. 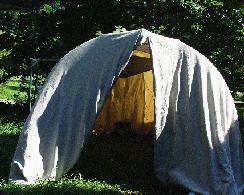 Medieval European merchants used arched tents as temporary shelters at fairs. Coryn Weigle, who makes tents for Medieval Miscellany … cites a letter written by a merchant guild to a town. The guild was no longer going to patronize the town’s fairs, the letter said, because there was getting to be a scarcity of available saplings in the area and the merchants weren’t happy about bring in their own. The Roma of the British Isles continued to used benders into the twentieth century. The classic Roma bender is an arched tunnel with a closed end and a purpose-made ridgepole with drilled holes. The tops of the side poles are then pushed into the ridge pole. The other two long poles are placed at one end (what will be the closed end of the bender) and bent over and lodged through the first two side poles. 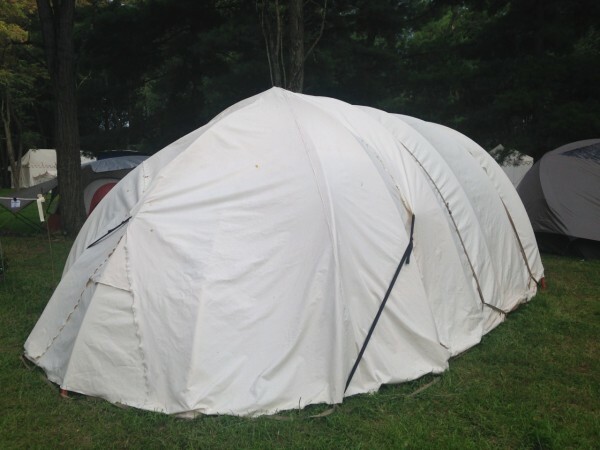 Many varieties of arched and domed tents are used around the world. 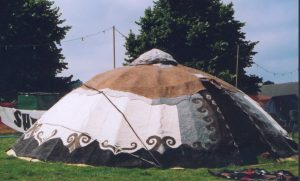 Arched tents were also used by nomads in Central Asia, including Iran and Afghanistan. There’s also a circular domed version that’s still in use in Iran called an “alachigh” where the poles are all brought to the center and inserted into a central ring like the ones used in a ger or yurt. This same semi-cylindrical arch style also shows up in a number of permanent non-tent dwellings, such as the traditional “Arsh” houses of the Toda people of South Asia, which use stone end walls, bamboo beams and rattan bent to form the side walls, which are then thatched with grass. Domed tents made of bent wood are also widespread in Africa, such as the Somali Aqal. Left, from Francophoto; Right, engraving of Winnebago Medicine Tent. 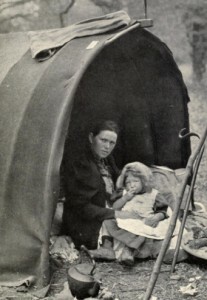 Arched dome and tunnel shapes with flexed poles are now the standard for modern backpacking tents, having largely replaced tents with rigid straight poles. 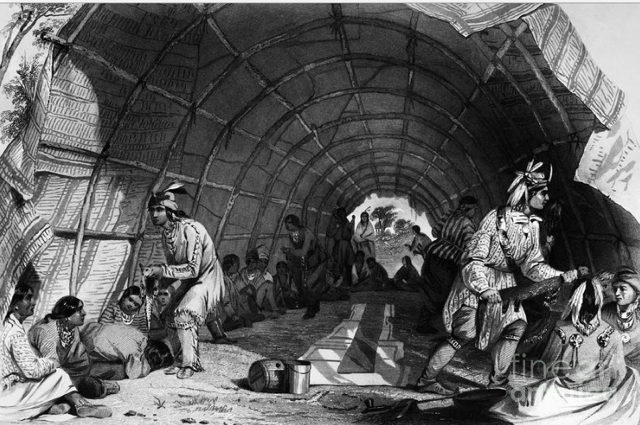 Durring World Wars I and II, metal-skinned arched tunnel shelters such as the Quonset Hut were used extensively for military shelters. This design was later adapted for use with cloth covers, and continues to be used in military and emergency-response settings. 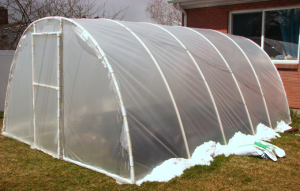 Arched tunnels are used as low-cost greenhouses. So-called “low tunnels” cover a single row of crops, while “high tunnels” can be dozens of feet wide and hundreds of feet long. Large installations are constructed from metal, while simple DIY versions can be built with wood or PVC. Various weights of plastic sheeting are used as covers. 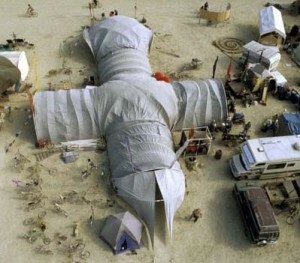 Arched tunnels are used for shade and dust protection at Burning Man, and numerous DIY guides are available showing variations on the construction technique. 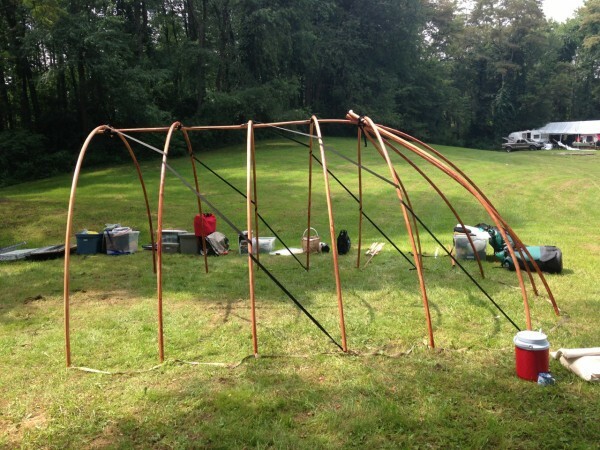 One of the most refined versions of this is the “Zook Arch”, a large tunnel using PVC poles, poly webbing, and vinyl tarps. The construction page includes some very helpful techniques we adopted in our design. 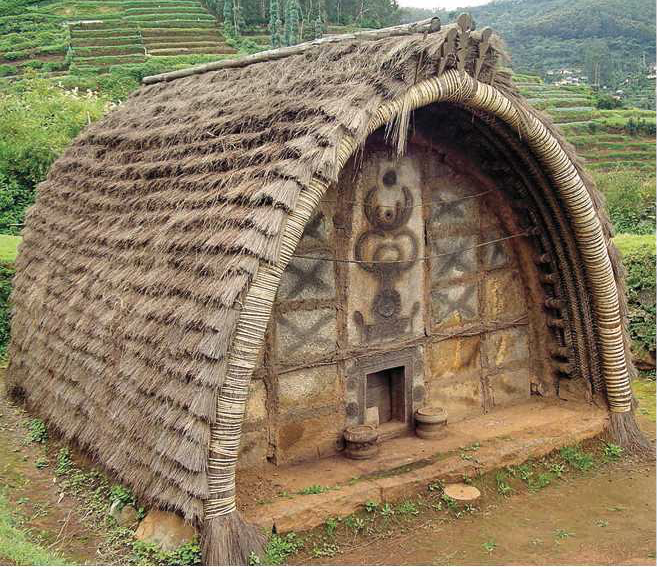 There are numerous variations, from the simple “Monkey Hut” design up to large, multi-bay designs connected by domes. 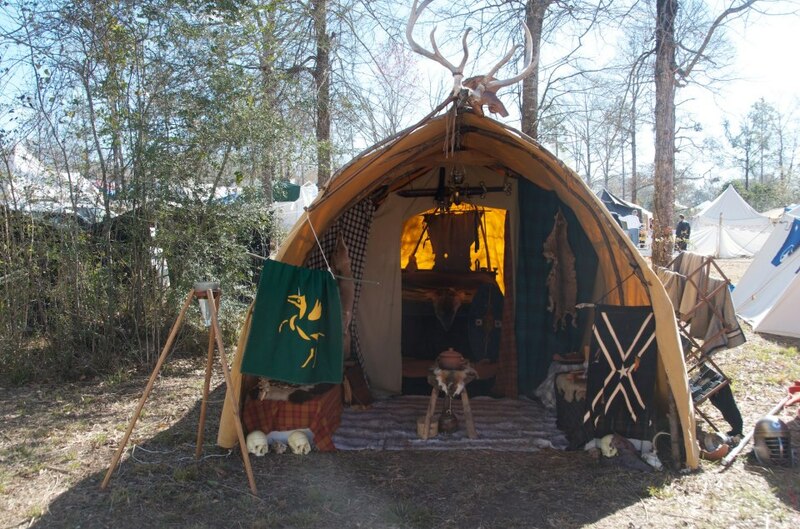 I’ve found images online of three other tents of this style in use in the SCA. Seigneur Guy du petit Egypte’ and Madame Putsha la Chiromancienne assembled a very helpful page that describes the construction of their Roma-style bender, which uses PVC poles and a canvas skin. Cairistiona Bhan and Seumas, Last of Gyver, built a lovely Celtic bender using hickory poles and canvas. I didn’t encounter these images until after ours was built, but theirs is truly inspirational. The cost for the materials was a bit over $300; $200 for the canvas (at $5/yard), $60 for the PVC poles ($3.50 each), $24 for the rebar ($1.50 each), $19 for 100 yards of webbing, $9 for YKK triglide slides, and $24 for a grommet and punch kit. 1x 10′ 1.25″ schedule 40 PVC Pipe; double-check to ensure that this fits over the outside of the 1″ pipe with a little wiggle room. A pair of thin disposable plastic gloves, like those used for hair dyes, first aid, or dishwashing. 400+ square feet of canvas, 10 oz duck; we used 35 yards of 60″ width. A saw, to cut the PVC; I used a small hand-held power jigsaw, or you could use a manual hacksaw. A power drill and 1/4″ drill bit. A sewing machine, to seam canvas together; this needs to be a sturdy unit to handle the heavy fabric, but doesn’t need to have any fancy features or attachments. A heavy hammer, to drive rebar and install grommets; I used a 3LB hammer. A lighter, to melt the ends of the poly webbing to prevent it from unravelling. A platform to stand on, such as a stepladder or crate; we used a Yeti cooler. We spent much of two days preparing the materials before heading to the camp site. 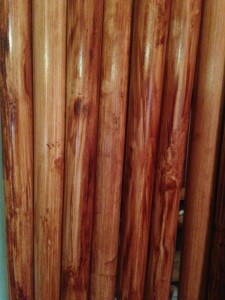 We used a technique found on PVCWorkshop.com to apply a wood-grain pattern to the pipes. First, sand the pipes. Tear sheets of sandpaper into halves, or another workable size. Wrap around the pipe. Sand pipes along their lengths, starting with the rougher grit sandpaper and progressing to the finer grit. Sand until the shiny surface has been stripped off and the size and branding mill marks printed on the pipe are no longer visible. Brush off any lingering dust. Staining the pipes is messy, so find an outdoor location, or cover a large work area with plastic drop cloths. Put on the plastic gloves. You can dip your gloved fingers directly into the stain, or optionally use a paper towel folded into a wad, or a disposable sponge, or an old rag to dip into the stain. Wipe stain onto the pipe, roughly covering the full length, then streak it by wrapping your gloved fingers around the pipe and pulling them lengthwise along it. Creases in the gloves, combined with the scratches left by the sandpaper, will create a wood-grain appearance. Experiment with different hand positions and motions until you get a look you like. Overlapping swipes and small twists of your hand can combine to suggest the burl of unevenly-growing wood. Minor variations will make some pipes darker or lighter than the others. 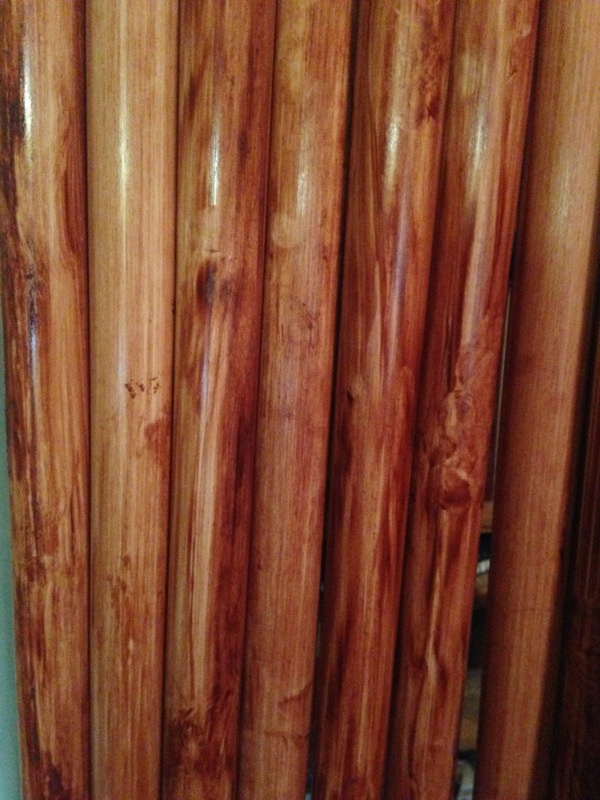 Lean stained poles against a wall or fence to dry for several hours or overnight. Use a saw to cut the one length of 1.25″ pipe into pieces: six pieces 1′ long, plus four pieces 7″ long. Optionally, wipe a bit of stain on the newly-exposed cut ends; or you could try cutting these first and then stain each piece separately. Drill a hole all the way through each of the cut pieces using a 1/4″ drill bit. The hole should be in the middle of the 1′ lengths, and 1″ away from one end of the 7″ lengths. Clear any detritus out of the holes. Cut ten pieces of webbing 1′ long, and seal the ends by passing them back and forth in the flame of the lighter for about ten seconds or so until the threads shrivel up. When they’ve cooled, twist them and feed them through the holes, then bring the ends around and tie them together. This bit of webbing will keep the pole ends from sliding through the coupler, and will allow you to tie other straps securely to the coupler. Cut the canvas into appropriate lengths. 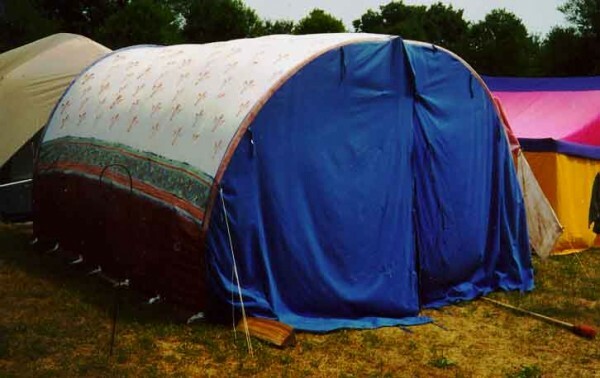 The main span of the tent will be 20′, but you will want some extra to account for shrinkage after it gets wet, and the remainder can be folded under to act as a mudflap and compensate for any unevenness in the ground. We used 24′, which was more than needed because our canvas didn’t shrink as much as we feared; 22′ might be sufficient. You will also need two shorter pieces to hang along the curved back end. We used 14′ lengths for these, but 13′ should be sufficient. Cut two pieces of the long length, and four of the shorter length, and then join pairs of pieces together with a flat (lap?) felled seam. Feeding 16+ pounds of canvas through a sewing machine can be awkward. Having a second person available to help position the fabric makes it a bit easier. It helps if you place the sewing machine on or next to a large table so you can slide the fabric along. If the weight of the canvas pulls the fabric off of the table, you may want to place a weight on it so that it doesn’t slide. We used binder clips instead of pins to hold the pieces of fabric together. Install grommets along the outside edges of each joined piece of canvas. 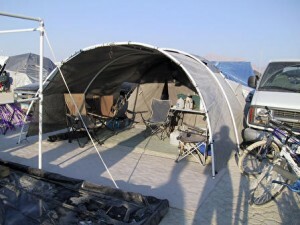 Select a mostly-flat site large enough for the tent’s 12′ x 16′ footprint. Begin setup by pounding in a rebar stake where each of the poles should go. Use a heavy hammer to drive in the rebar stakes. Consider protecting yourself with heavy leather gloves and safety goggles if available. Caution people in the area about the the rebar stakes, which often have sharp jagged edges; until they have the poles slid over them you’ll want to be very careful not to cut your shin open on one of them. The rebar should be driven vertically, and pounded more than half way into the ground. You want the stakes to be positioned accurately so , but if you hit a rock in one spot you can pull the stake back out, shift it over an inch or so and try again. 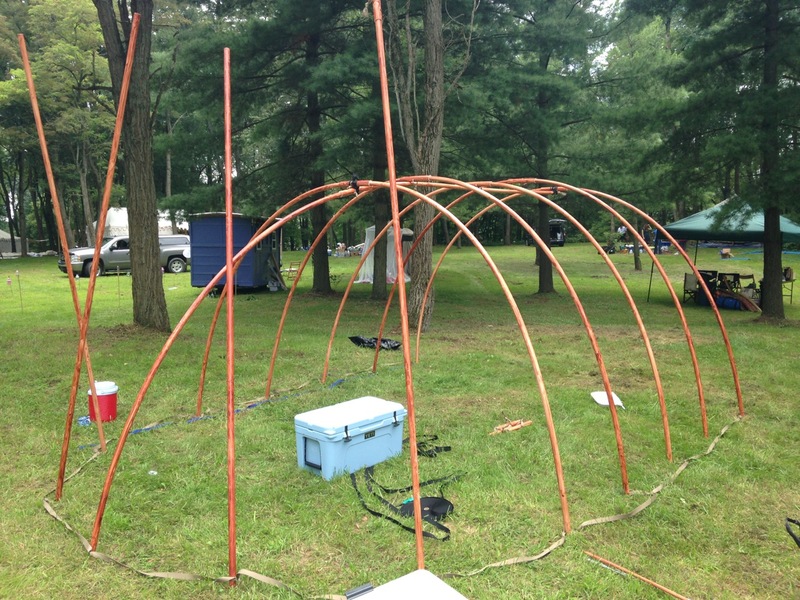 Measure out a 10′ straight line that will form one side of the tent, and place rebar stakes at the 0′, 2.5′, 5′, 7.5′, and 10′ marks. Measure out a second 10′ straight line, parallel with the first and 12′ away from it. 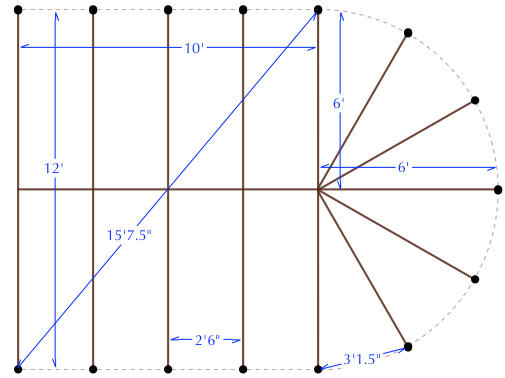 Confirm the lines are parallel by measuring both diagonals, which should be 15′ 7.5″. 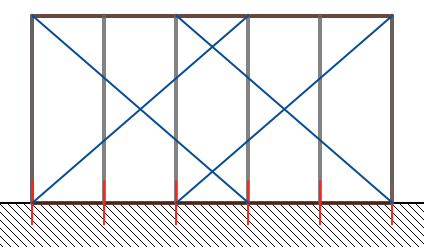 Pound in five stakes at the 0′, 2.5′, 5′, 7.5′, and 10′ marks. Lastly, place the five stakes in the back curve. Locate the center point of the back 12′ line, then pound in five stakes each 6′ away from there, evenly spaced about 3′ 1.5″ away from each other. Use a coupler piece to connect two poles by sliding it over their ends. Slide one one end of it down over a rebar stake, then bend the other end down and slide it over the matching stake on the other side. Repeat for all five ribs. Form the spine by joining two poles in the same way. Position the spine underneath the ribs, then raise it up and slide the far end on to the center back stake. Drag something into the middle of the tent that you can use as a platform to reach the ribs overhead. Use short 18″-24″ lengths of webbing to tie the spine to the ribs where they cross. Make sure that the ribs are evenly spaced along the top of the spine, and are tied tightly so they will not slide around. Set up the last four ribs around the back end. Slide a short coupler piece over one end of a pole, and slide the other end of the post onto one of the remaining stakes. Bend the pole down and tuck the short coupler piece under the center of the last rib. Use short lengths of webbing to tie them to the crossing point. Use a few lines of webbing passing through the ribs at an angle to make the structure more rigid. Carefully slide posts part way up the rebar stake to allow you to loop the webbing around the bottom of the stake, then slide the post back down to trap the webbing below it. Tie a webbing line at the foot of the fourth rib and angle it up and forwards, looping it around ribs three and two before reaching the center of the first rib where it crosses the spine, then angling back down to the foot of the fourth rib on the other side. Draw the webbing tight and tie it off. Repeat with another webbing line at the same angle, placed two ribs further back. Add a webbing line that angles back from the foot of the fifth rib, up and around the back curve, then back down to the foot of the fifth rib on the other side. Place the two long piece of canvas outside the tent along one straight wall, and the two shorter pieces of canvas along the back curve. Stand on the platform and hoist one of the shorter pieces up and over the top of the ribs and spine. Adjust the canvas so that the edge reaches the ground along one side of the back curve. Tie webbing straps to the the grommets and stretch them down over the ribs to anchor the other end around the stake under one of the pole ends. Then hoist up the second shorter piece of canvas and position it in the same way. 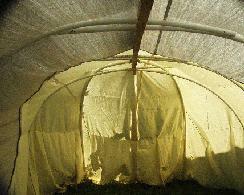 Finally, stretch the large piece of canvas over the ribs in the main body of the tent. Adjust the position of the three pieces of canvas to minimize gaps around the edge. Smooth out the canvas, adding some folds or pleats where needed and ensuring that those pleats will not channel water into the tent. Use webbing to fasten the canvas into place and draw it taut. 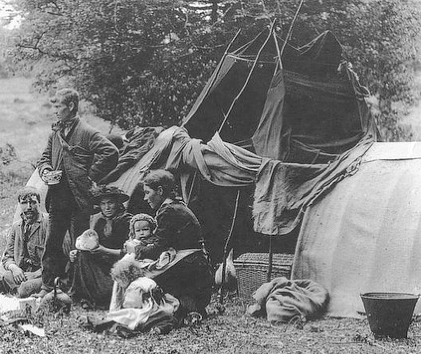 Hang curtains across the front, and move your possessions into the tent. 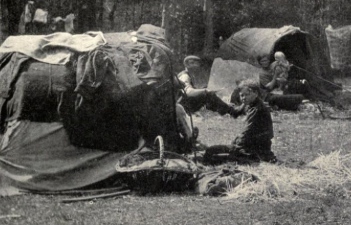 Taking down the tent is straightforward. Loosen the straps that hold the canvas in place. Take down the canvas and fold it for storage. 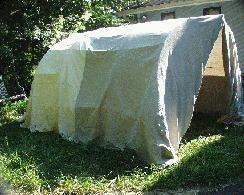 Make sure the canvas is dry before storing it or it may mildew or rot and be unusable next year. Remove the webbing straps that hold the ribs and spine together. 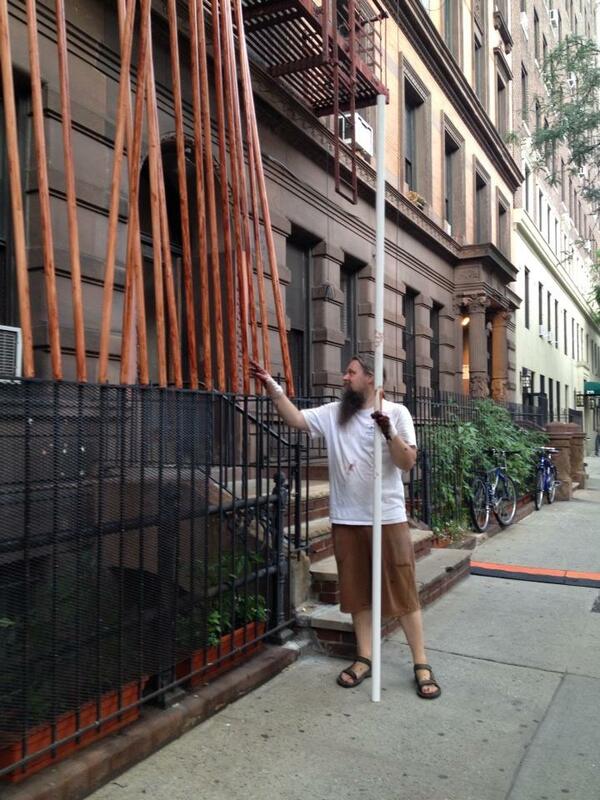 Remove the poles by sliding them up off of the rebar stakes. (Remember that they’re under tension, so be careful that they don’t spring up unexpectedly and hit you in the face!) Take down the rear ribs, then the spine and lastly the side ribs, separating the poles and couplers. Lastly, remove the stakes. (Remember that they’re sharp, so warn people to avoid them until they’re out of the ground.) Loosen the stakes by hitting them a couple of times with the hammer from each side, then use a heavy leather glove to pull them out. 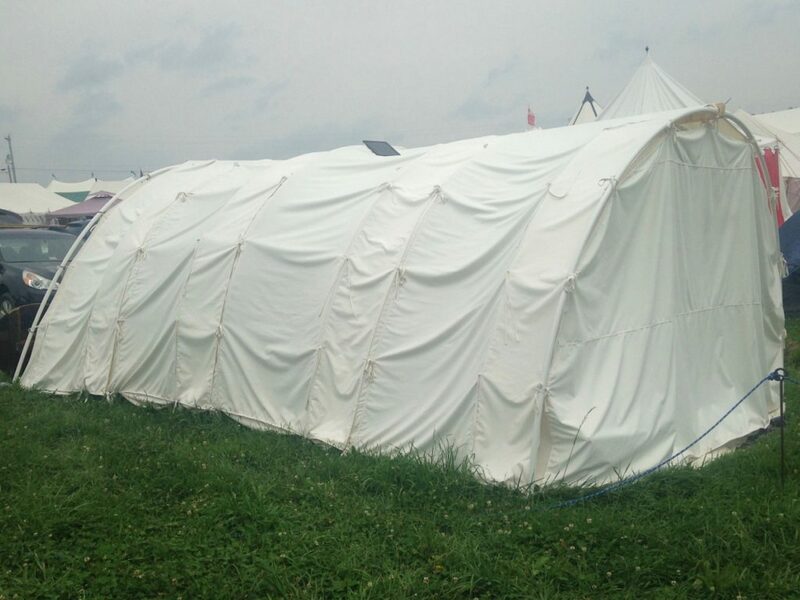 We were very happy with the design of the tent frame. The tent doesn’t require a central pole inside the tent area, nor does it need any guy lines outside of it. It covers about 175 square feet of space, most of which is tall enough to stand in. We look forward to using this tent again next year. The main change we made this year was to add another piece of canvas along the back of the curve to allow for a greater overlap — the previous setup included just enough canvas for the edges to meet if they were held just exactly right, but inevitably they would end up gapping by a little bit. Adding another piece of canvas in the back helped to solve this problem. 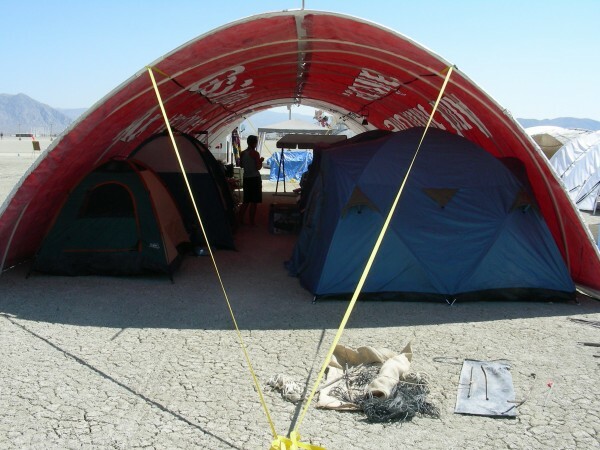 Also, we ended up not using the tensioning straps over the top of the tent or the sawline strap (running around the bottom edge of the tent) — this is a key part of the Burning Man “Zook Arch” design, but they’re using lighter material than our heavy canvas, and they have to deal with much higher winds than we have at Pennsic. We’re in a very sheltered location, and didn’t have any problems with the canvas flapping around. We replaced the curtains across the front opening with a double layer of mosquito netting — admittedly not period, but it provided enough privacy for our location while allowing for some air circulation. 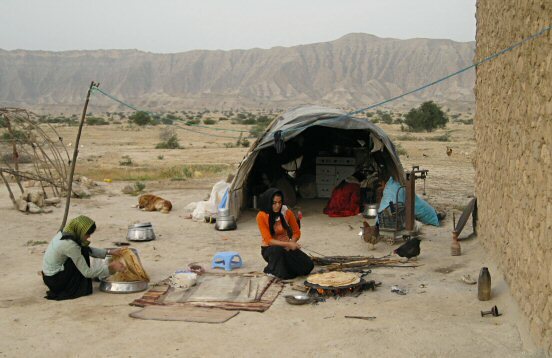 This year we moved out of our former site in Dagan’s Dell and down to a camp on Chandler’s Road near Via Chingis. With the additional wind exposure in this location we found that we did need to throw a couple of tensioning straps over the top to keep the sides of the canvas from blowing upwards in the wind. We also found that the mosquito netting on our front door was an insufficient barrier to stop rain from blowing in and afternoon sun from angling into the back of the tent, neither of which had been a problem in our former location. We hung some additional fabric across the doorway and we’ll aim to rig up a more-secure set of door flaps for next year. 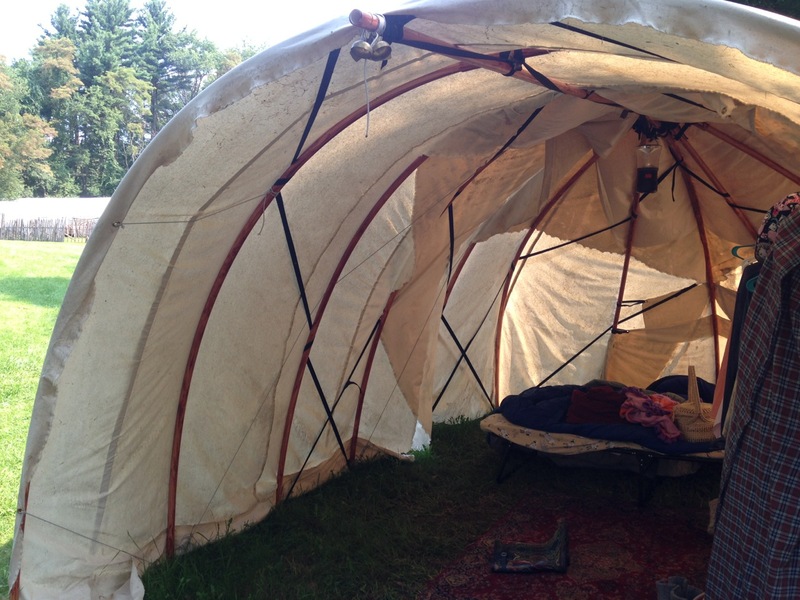 Other than that, the tent has continued to hold up fairly well through its fourth year. There was one area of the canvas which dripped during the worst rainstorms that’ll need to have a little water sealant applied or a second layer of canvas thrown over it. I’ve been considering building another one of these tents for another group in our household, and figured I would make the cylindrical section a little longer and omit the rounded end. You could then choose to either have doors on both ends, or seal off one end with a solid piece of canvas and have an entrance only on the other end. 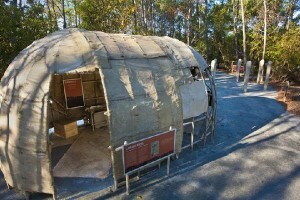 This would simplify construction and setup — getting the rounded section laid out correctly, binding the free ends of the poles at the top, and adjusting the canvas to cover the rounded end all definitely require a disproportionate amount of work, and because the headroom in the curved end is reduced, it adds less usable space than the floor plan might suggest. The rounded end provides some lateral stability, so that the arches don’t wobble towards one end and then the other, but it turns out that the diagonal webbing lines also effectively address that issue. By “diagonal webbing lines” I mean the straps (or ropes) that angle from the foot of one arch over to the top of another and then back down on the other side. In our construction shown above, these only angle in one direction, because the arches of the rounded end resist movement in the other direction. If you omit the rounded end, you’d want to send at least one of those diagonal straps in both directions, and maybe a pair in each direction, along the lines shown below. At Pennsic XLVI (2017) I was pleased to note that one of our neighbors in an adjacent camp had constructed a bender of their own. Jason Pedicord and his wife Lenore used the notes on this site as a starting point in designing their own bender, with great results. They worked with a local Panther distributor to put together a custom canvas stitching order for a set of three overlapping panels and two end flaps with integrated ties along their length that simplify the process of attaching the canvas to the poles. They use a Romani-style ridge pole, which has also proved useful during setup as it allows them to quickly mark the locations for the rib poles on each side without tediously measuring the distances between them. The integrated ties are a particularly nice touch, as they allow the canvas panels to be fastened to the rib poles without additional webbing lines, as well as tied to each other, and can support items such as lanterns and clothing rods being hung from the inside. Please feel free to contact me or comment below if you have any feedback or questions about this style of tent. 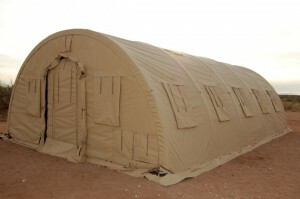 I look forward to seeing more of these tents on the field, and would be glad to chat with you if you’re interested in building one of your own. Hello! I am looking into building something like this for Pennsic this year. 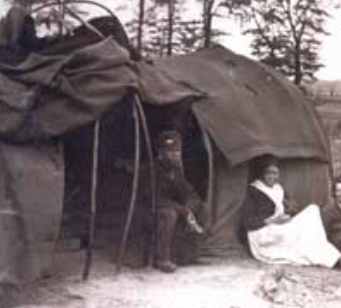 The 46th war will be my second year, last year we stayed in a very synthetic tent and experienced a serious rain storm where half of our camp had a river running through it. 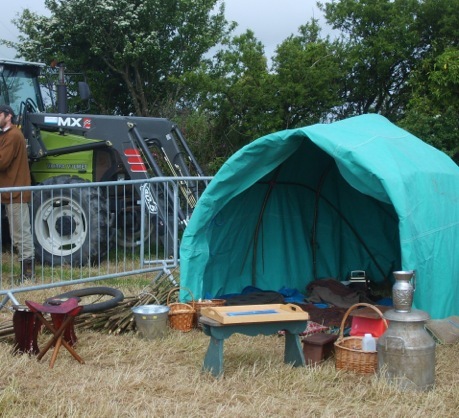 We stayed dry, thankfully, but I’m wondering, with this style tent, what did you to about a floor? Rugs and such maybe? With regard to flooring — you could certainly put down a ground cloth if you desired, but we instead use a couple of “outdoor rugs” purchased from the patio section of Lowes/Home Depot. We place these in the middle of the tent, and leave some areas around the edges as plain grass without any flooring, and our bed legs just stand on the grass. In terms of canvas, we bought ours as a local retailer here in New York City. 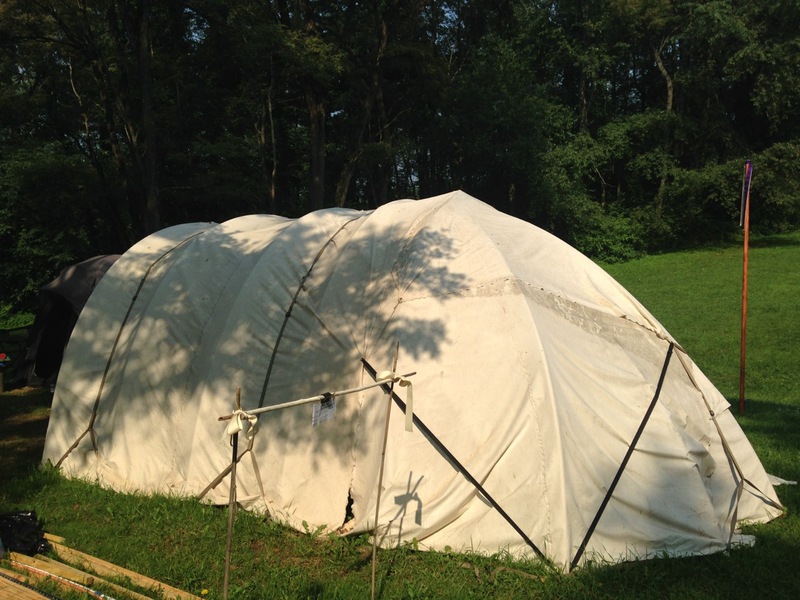 We paid $5 per yard, for a total cost of $200 — it’s by far the most expensive element of the tent. 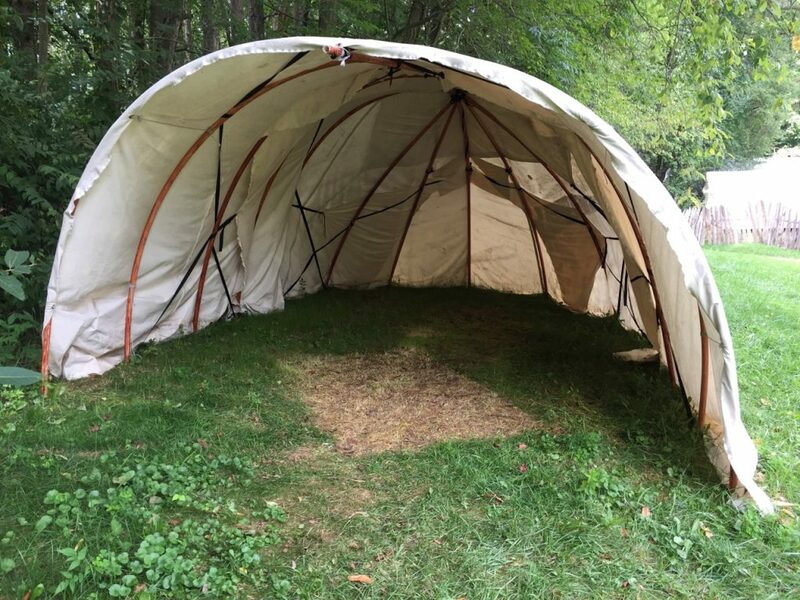 We bought a large roll and machine stitched panels together at home, but you may be able to find tarps already pieced together that are large enough to serve this purpose — or if you don’t mind spending a bit more, tent vendors will custom-stitch fabric to the size you specify.